The Prinz Eugen was an Admiral-Hipper class heavy cruiser, one of five such vessels. She was launched in 1938 and entered service in 1940. The origin of her name was Prince Eugene of Savoy, a celebrated Austrian general of the early 18th century who won a string of victories against French and Turkish armies when commanding Habsburg forces. Prinz Eugen had a top speed of 33 knots and displaced 16,970 tonnes. Her crew consisted 1,380 officers and men, and she carried three Arado reconnaissance aircraft that were launched by catapult. Prinz Eugen’s main armament were her eight 20.3cm (eight-inch) guns, arranged in four turrets, two forward and two aft of the bridge. 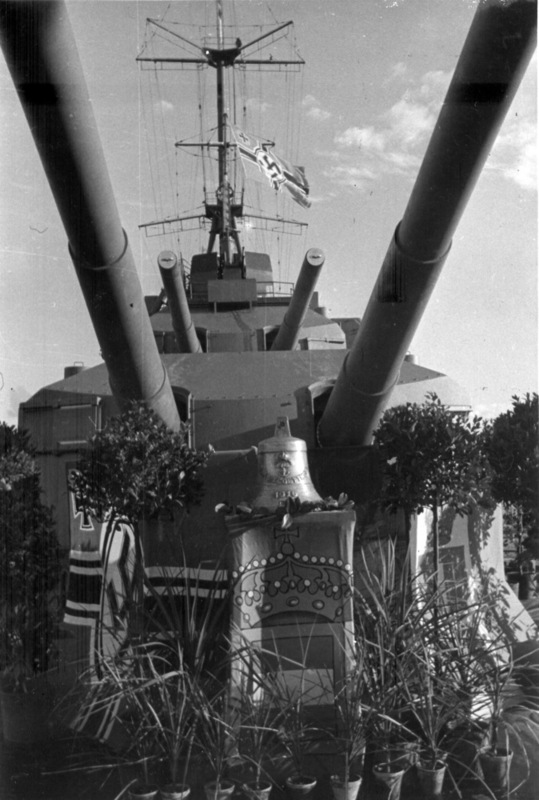 Her secondary armament consisted of 12x10.5cm (4.1 inch) guns, and 20 other anti-aircraft guns. The armoured belt around her hull was 70-80mm thick, while her upper deck was provided with armour 12-30mm thick. Prinz Eugen’s association with Austria was celebrated at her launch in 1938: the Nazi governor of Austria was present, as was Admiral Horthy the Regent (de facto ruler) of Hungary. He had commanded the Austrian World War I battleship Prinz Eugen in 1917-18. This photo was taken by one of the crew, and illustrates one of the major occupations of life on board a warship: painting the ship. Prinz Eugen’s crew were preparing her for full-scale commissioning when she was hit by RAF bombers during their raid on Kiel of 1st July 1940/ She was eventually to go to sea on 1 August 1940. 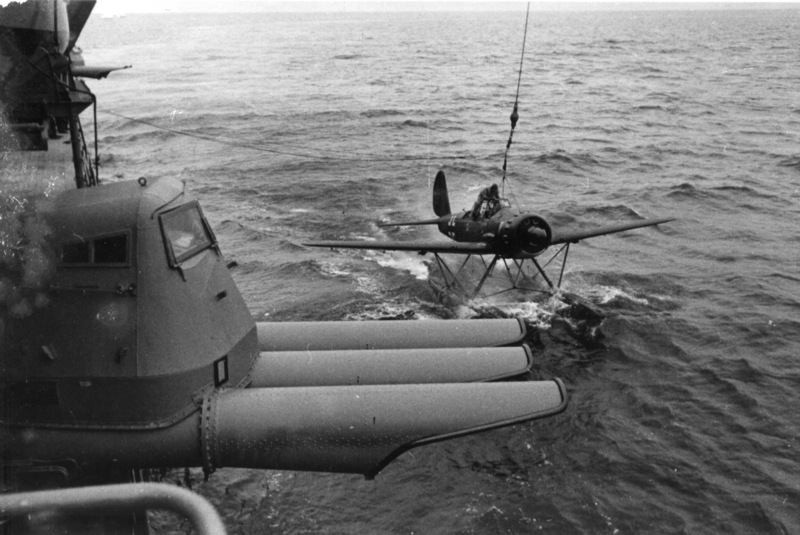 One of Prinz Eugen’s three Arado low-wing monoplane seaplanes prepared to be winched back on board after a mission. Also visible in the photograph are three of the vessels 12 x 53.5cm torpedo tubes. This photo was possibly taken late in 1941, during trials and training exercises conducted in the Baltic Sea together with the battleship Bismarck, as the two vessels prepared for the break out into the Atlantic. 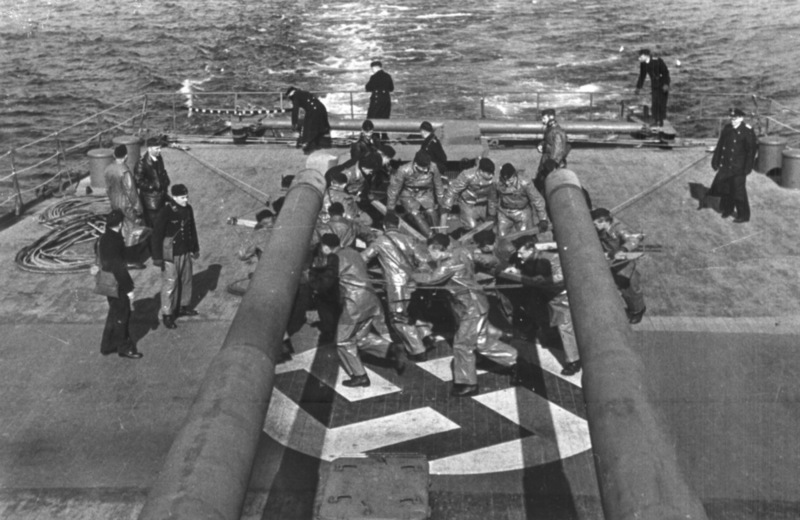 Operation Rheinübung, the break out by Bismarck and Prinz Eugen into the Atlantic, had been planned for late April 1941, but on 23 April Prinz Eugen was damaged by a magnetic mine dropped by British aircraft. Damage was extensive to fuel tanks and propeller shafts, for example, but repairs were made in short order and on 22 May Prinz Eugen escorted Bismarck towards the Denmark Strait between Iceland and Greenland, looking to head for the north Atlantic to prey on Allied merchant shipping. 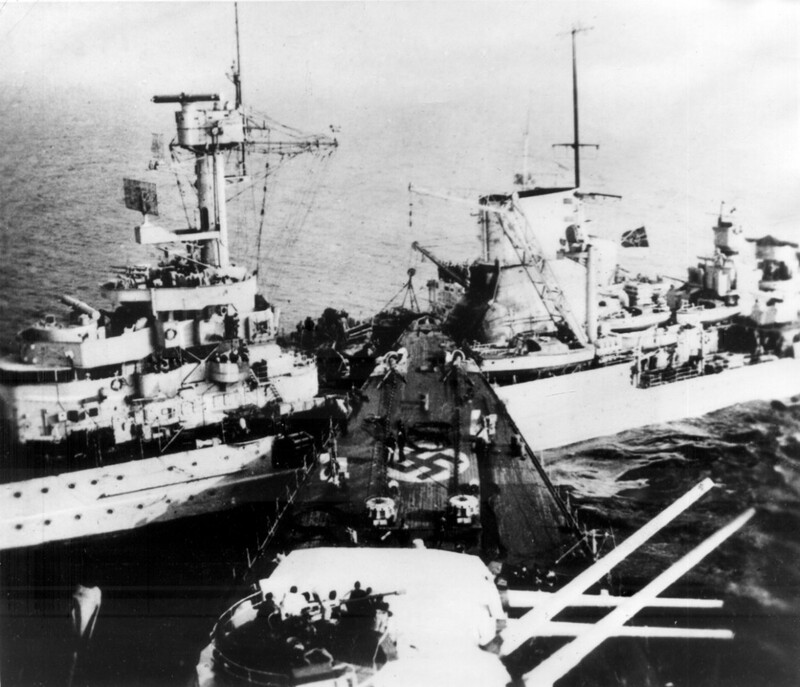 It was during this manoeuvre that Prinz Eugen’s radio-intercept team realised that they had been detected by the Royal Navy and were being shadowed. They were attacked by the Royal Navy battlecruiser Hood and battleship Prince of Wales. Prinz Eugen scored hits on Hood, and then on Price of Wales. Bismarck herself was hit, however, and Prinz Eugen was now ordered to head back to France. 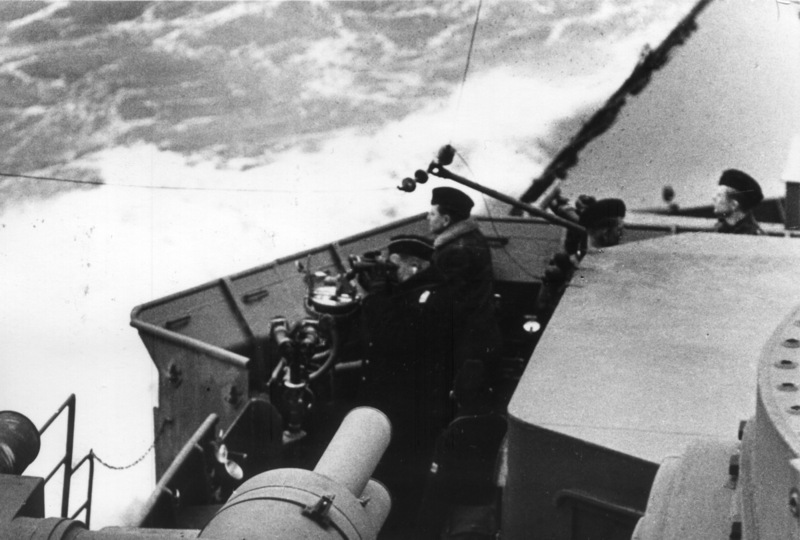 Prinz Eugen crew members keep a close eye out for Royal Navy units during the Channel Dash. 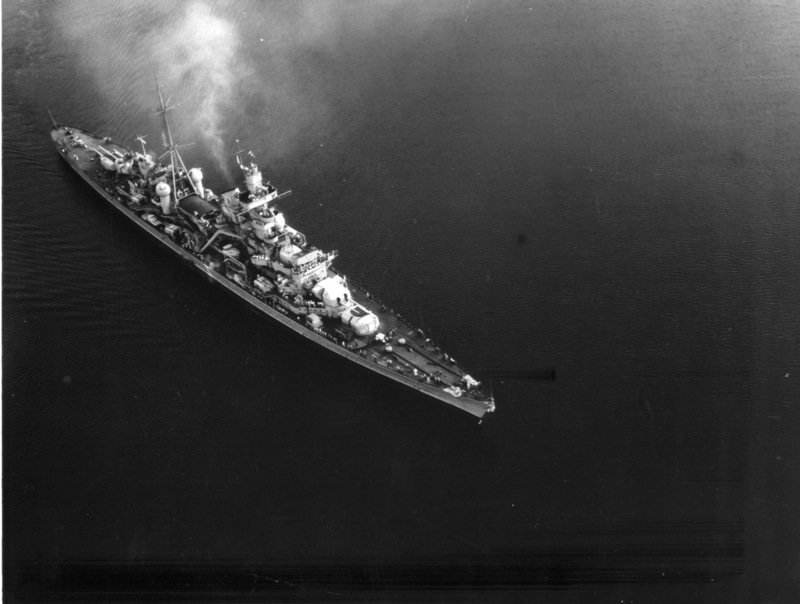 Although Prinz Eugen had managed to return to the French port of Brest in summer 1941, she was still under constant attack from RAF bombers. On 1 July, 60 of her complement were killed in a single air raid. 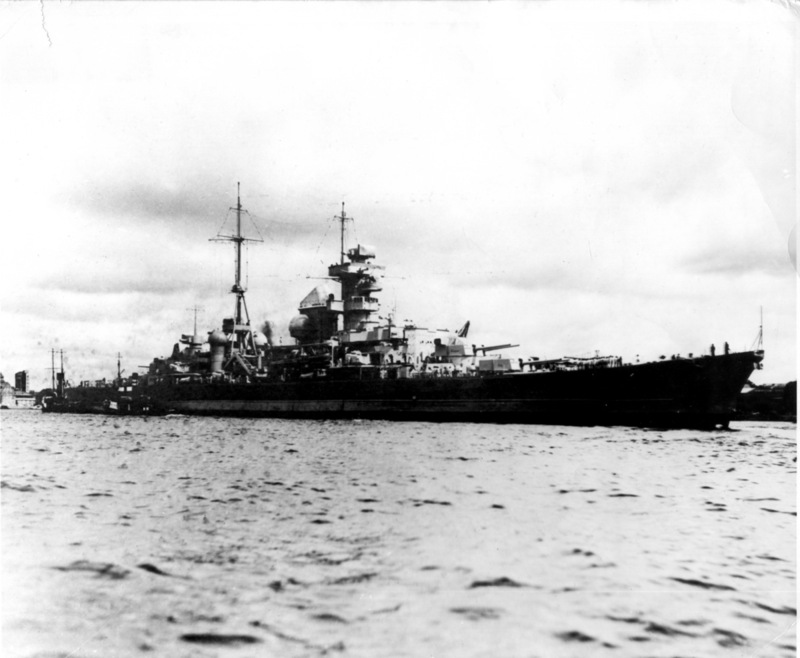 The two German battleships Scharnhorst and Gneisnau were also regularly under attack in Brest, and so it was decided to move the three vessels to Norway, to attack British convoys taking supplies to the Soviet Union. This move, designated Operation Cerberus, took place in February 1942. The first move was to sweep a passage through British minefields, and then the three capital ships slipped out from Brest under cover of darkness, escorted by torpedo boats and the Luftwaffe. During the Channel Dash, Prinz Eugen came under fire from British coastal artillery, from Royal Navy motor torpedo boats, from RAF torpedo planes and finally from British destroyers. The latter were driven off in a short engagement by the heavier guns of Prinz Eugen, and the German cruiser managed to avoid the clusters of torpedoes launched by the Royal Navy vessels. 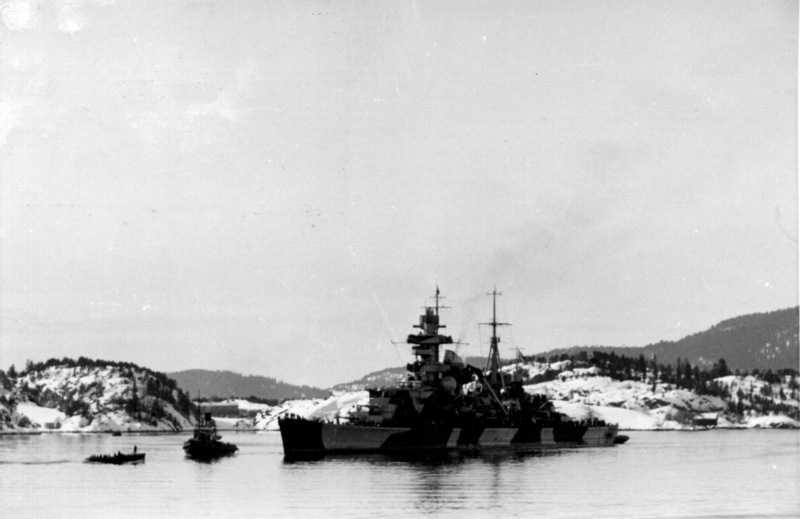 By late February, Prinz Eugen had reached Norway. Prinz Eugen at Lofjord for repairs. 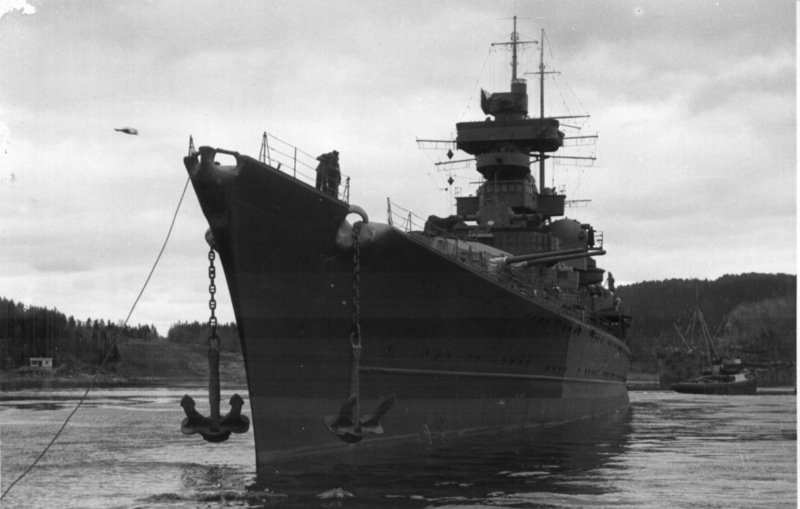 Once in Norway early in 1942, Prinz Eugen was to be based in Trondheim. However, while patrolling the coast off the Trondheimsfjord, Prinz Eugen was spotted by the British submarine HMS Trident, which torpedoed the German cruider in the stern. She was towed back to safety and then brought to Lofjord where running repairs were affected. 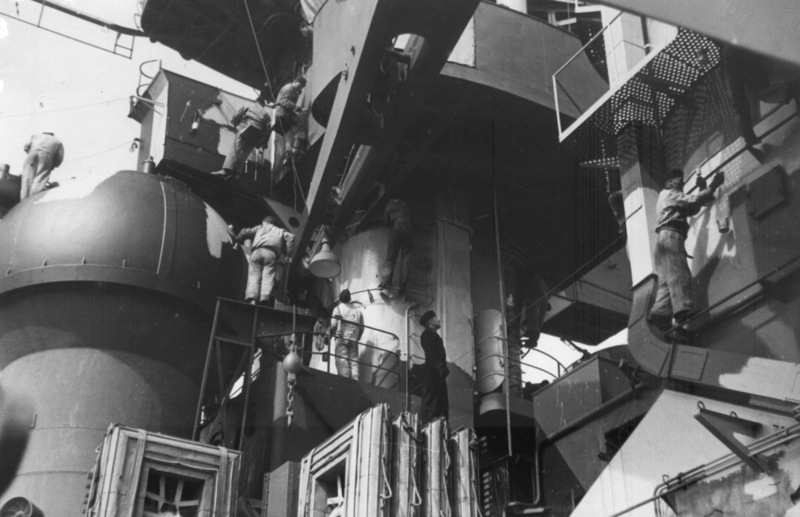 While at Lofjord after being torpedoed, the entire stern of Prinz Eugen needed to be rebuilt, while the main repair needed was to her rudder. It proved impossible to make adequate arrangements in Lofjord, and so two jury-rigged rudders that had to be operated by hand using capstans were fitted. In May 1942 Prinz Eugen sailed for Germany but was spotted by the RAF and attacked while at sea. In spite of her poor steering apparatus, the German cruiser managed to avoid being hit. 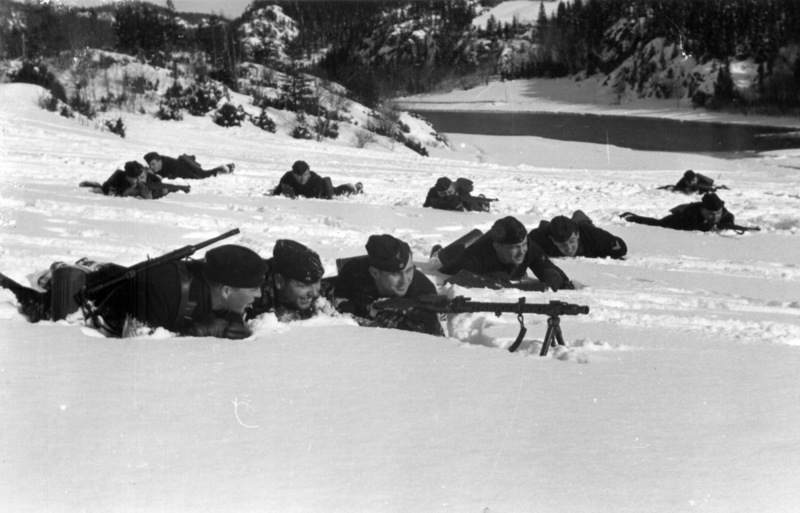 Crewmen of Prinz Eugen train with machine guns in the Norwegian snow during the period of repair and maintenance at Lofjord. In fact, in 1943 Prinz Eugen spent much of her time engaged in training exercises, in which German naval cadets were given experience of naval operations during cruises in the Baltic Sea. After use as a training vessel for much of 1943, Prinz Eugen returned to active service later that year when it was decided to use her as artillery support for the hard-pressed German forces retreating from Finland and across the southern littoral of the Baltic. In August 1944 Prinz Eugen was heavily involved in fighting off Finland and in the Gulf of Riga. The cruiser fired hundreds of rounds during these operations - 500 rounds from her main guns alone on two days in November. It was during this campaign that Prinz Eugen rammed the light cruiser Leipzig, during fog. 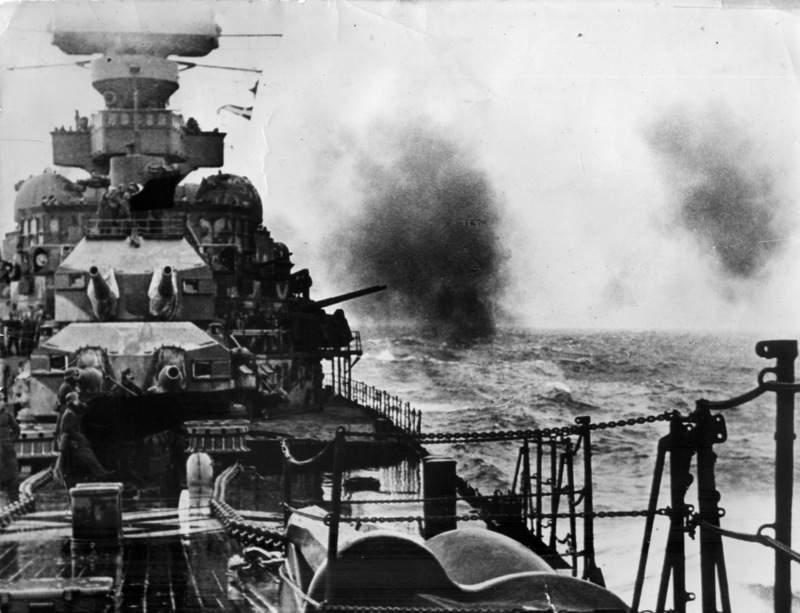 Leipzig was almost destroyed by the impact, and it took 14 hours to prise the vessels apart. Prinz Eugen at Bikini Atoll, 1946. Prinz Eugen had led a charmed life during World War II, narrowly escaping destruction on many occasions and was one of only two major German vessels to survive the conflict. The final escape occured in April 1945, when, in port with the pocket battleship Lützow, she was attacked by RAF Lancaster bombers. Lützow was sunk by a single hit from a Tallboy bomb, but Prinz Eugen sailed away to Copenhagen, where she was taken into the possession of the Royal Navy. She was then acquired by the US Navy. Practically unsusable because most of her boilers had broken down she was towed to Bikini Atoll and used as one of the ships tested under atomic bomb blasts. This ever-lucky vessel survived two blasts, but sprung a leak which was not repaired because of the fears of radiation. Eventually she capsized and sank in December 1946.